Haven’t written a review in a while… this one was originally written for Passionweiss. 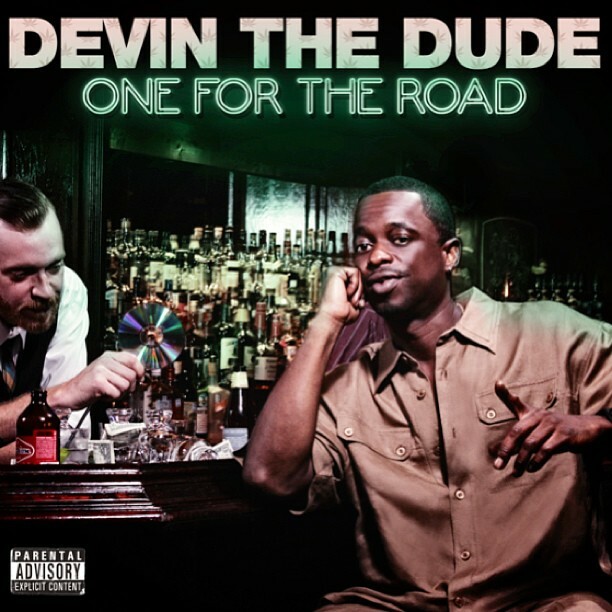 Devin The Dude is the kind of rapper you want to hang out with. He’s a chilled out guy who usually rhymes about what he loves most: beautiful girls and the finest kush. The Dude never reached the same mainstream status as other O.G rappers during his 20+ year career, but he seems to like it that way. His introspective and sometimes self-deprecating lyrics coupled with his sheepish grin make him a likable rap everyman. Just like fellow THC enthusiast Curren$y, Devin Copeland’s seems like the kind of person who would buy you a beer instead of denying you an autograph. Scarface has previously said that an artist should keep remaking the same album and carve a lane for themselves rather than trying to do something new. Despite that not always being true, Devin definitely followed this formula and his 8th album, One For The Road is exactly what a long-time listener should expect. The 43-year-old doesn’t stray too far from his niche laid-back vibe, yet he still knows what works. This is smoke and ride music. Opening track “Getting Blowed” sets the scene with the extremely relaxed Houston native rhyming over a breezy saxophone about how he never goes out, but you’ll probably catch him in the supermarket with the munchies. The Dude is at his best when he’s showing some humor or conveying his humane side. Six tracks on the album have a motivational theme which eventually wears a bit thin and “Reach For It” is a little preachy with a generic “hustle hard” message that dime-a-dozen rappers have been drilling down our earholes since the beginning of time. In contrast, Devin’s take on giving money to the homeless on “Fresh Air” works well because you can empathize and there’s no sign of the forced sincerity that plagues young rappers like J.Cole. “I hope we don’t get too drunk,” features Devin alongside his Odd Squad group mates Jugg Mugg and Rob Quest, who you should know for their excellent and largely ignored debut, Fadanuf Fa Erybody!! The trio bounce off each other and it’s a fun listen with old school production. Compulsory weed track “Herb The Nation” also follows this retro vibe with Copeland clearly paying tribute to some of his influences. If you were in high school when Chronic 2001 came out, your first experience with Devin The Dude was probably on the classic “F**k You” alongside Dr Dre before headphones and Snoop before trips to Jamaica. Unfortunately there’s nothing as tongue in cheek on here, instead the Houston vet delivers the break-up track “Probably Should Have” and the overtly sexual “Hear The Sound.” Both tracks are decent in their own right, but not quite as special as their sleazy predecessor. There’s a snippet during the album’s third skit for a track simply titled “F**k You Down” which has potential and the “comical” announcer says is coming out soon, so let’s hope he’s being serious. While this project isn’t particularly innovative, it’s not trying too hard either. Devin wrote and produced most of the tracks and many of them have The Dude’s listenable charm. His topics are humble and attitude is too. It’s a rare thing to treasure in the age of self-proclaimed musical geniuses, leather pants and artists who fight their own fans.